How many plastic bottles do Americans use every hour? How many acres of rainforest are cut down every minute? What is the most cost effective way to dispose of trash? 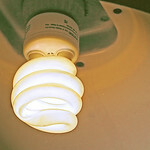 One glass bottle can power a 100-watt bulb for ___ hours. Each person creates about ___ pounds of waste every day. How much energy is saved by recycling an aluminum can as opposed to creating a new one? The average office worker uses ____ sheets of paper per year. ___ trees are cut down every year to provide raw materials for American paper and pulp mills. A TV can run __ hour(s) from the energy saved by recycing a single aluminum can. According to popsci.com, ______ is America's Greenest city. Every ton of new glass produced generates ____ lbs. of air polution? The Department of Agriculture found a way to make disposable diapers out of ____. Recycling one ton of paper saves? The percent of solid waste recycled in Japan is 50%, Western Europe is 30% and the United States is? What day is observed as World Earth Day? Which country currently emits the most greenhouse gases? Which of these lightbulb types use the least amount of energy? How long does it take carbon dioxide to disperse in the atmosphere? Climate change is accelerated by the reduction of global snow and ice cover. What is the leading source of energy in the United States? How much of the Earth's water is available for human use? How long does it take a Styrofoam cup to decompose? According to the World Health Organization, what is the most polluted city in the world?